Over the past month I’ve been pushing affiliates sales with varying levels of success and I’ve been pretty much ignoring Adsense and even removing it from some pages to concentrate more on sales, so I’m some what surprised to be sat here on Cyber Monday writing about hitting one of my Adsense goals, the $1,000 Adsense day 🙂 😀 . So why am I writing this? Basically for inspiration and show that anybody with work and commitment can make a nice income on the web. I first started using Adsense on September 21, 2004 and my earnings for that day were $0.00 (great start), followed by $0.82 the day after. The rest of 2004 and most of 2005 I spent learning as much as I could from forums and my own experimentation and really started taking action in the second half of 2005, in hindsight it would of been more profitable to learn by doing more. Over the last couple of years I’ve had various ups and downs and learnt from making plenty of mistakes along the way. I quit my day job at the beginning of this year (which is scarily marked by the massive dip on the above graph) and have continued to build ever since. For people just starting out with Adsense or making money online and are finding it tough, it gets easier. I remember being excited as hell on my first $1 day and then the $10, when I hit $1,000 in a month I was over the moon. All it takes is an open mind, work, commitment and perseverance. I now need to get back to pushing affiliates, it is Cyber Monday after all. Cheers Scott. It’s been a very exciting month so far and the Adsense high is the icing on the cake. Another big plus is I’ve learnt a tonne of things I want to try next year. $1000 in a day isnt bad at all! I am currently on $608 for the month for Adsense 🙂 so a little trailing there. Adsense makes up about 60% of my income at the moment. Things are picking up at a faster pace though. As the monthly numbers are calculated I find that traffic increases on average 1.39 times more then the previous month (calculated for the last 8 months). I find that perserverence is key. Just keep on going each and every day and it starts to work it’s self out, although there is more to it then keep on going. But keep on going is the main key because if you stop then whats the point in learning how to optimise ads and such. I totally agree about perseverance, it does take time and a lot of effort. Congrats on the $608 so far, you must be getting close to your first $1000 month which is exciting and a big step on the way to more. Yep. It’s getting closer and has taken hard work to get this far. I will hit my first $1000 month this month (I estimate I have done it already this month with aff sales and chitika etc…) but I hope to see the first $1000 adsense month next month. I’ve been stuck on a dollar or two a day now for ages, but to be fair, my sites don’t get enough traffic yet to expect much more than that. A one page mini site is proving to be my best earner too, so maybe a couple more of them can help me reach the $10 a day goal. I don’t think adsense is really working on my forum, so I’ll have to come up with something else on that. Congratulations. Thats a great achievement. Congrats, Al!I hope the next big step takes half the time. It is the first time I’ve noticed this. Chinese character domains! Probably China 🙂 , thanks for the congrats. It is difficult at first time wise. When I started my journey I had a pretty stressful 9-5 job that demanded a lot of hours, I could also get near unlimited double pay hours at weekends. At first it was great because I could earn a nice income working for somebody else but I wanted more so I did have to make sacrifices with both time and money at the beginning, it was worth it though. PS: Al, what’t the next target? 50k a month from Adsense? My next target is more with affiliates. I love Adsense (obviously) but I do want to diversify more. For the past 6 weeks or so I’ve been working on affiliate sales, they aren’t up to the same level as Adsense yet but are getting there. Next year I want to play more with PPC. So goal for this time next year is $100K a month. $100k is achievable with the path you are on. That’s $3333/day which looking at the history of your site should be just a matter or time. It’s just a shame it’s not £££’s instead 🙂 I would actually be surprised if you didn’t get that goal by the end of next year. This is soo exciting…i’m at the bottom rung of this adsense thing but it’s inspiring to hear other people’s stories! Wow!…I struggle with $10 a month! I just don’t have the traffic yet so i’m working on that bit first! Its sometimes called as luck too 🙂 because i have got several sites on the top of the search engines, heavy traffic but damn no ROI from adsense ppc. I hope to earn $1000 per day someday with everything but I never imagined an Adsense goal with this number. I am at around $100 per day. Can you disclose on how many websites you have Adsense? how many sites have your adsense code? I run about 25 sites, the majority of those Adsense earnings where off just the one, CG. Absolutely amazing. I’m sure you have put in the hours because $1,000 a day doesn’t just “show up”. Are you maintaining all the 25 sites yourself or did you hire help? Thanks Mikael,with my main site (www.Coolest-Gadgets.com) I have the help of a part-time editor and 6 paid writers, I have help on some of the other sites but most of them do not need any ongoing maintenance and just run themselves. I’m so impressed with what you have done at CG. But I’m even more interested in the 24 sites that “run themselves”. Did you ever create a post about how to do that or would it be possible to have you do one? That would be interesting to hear. Does most of your AdSense income come from coolest-gadgets? CG is the biggest contributor yes. Thanks Wendy, I took the family out on Monday night and then bored them with traffic and affiliate scheme conversations. I can see that you have about 55k pages indexed in Google for your CG site which means that you will only need to make about $0.02 per page per day to achieve the $1,000. That brings hope to me as I think it can be duplicated in many niches if you just have enough indexed pages (with quality content that is). It doesn’t really work like that. The site has just over 5,000 original posts but with summary and search pages Google has a lot more indexed. It’s more important having links coming in than the number of posts, in my case it was easier to get links by having multiple original posts. With regards to traffic some pages receive a lot more than others. I totally agree but as you say it will become much easier to obtain those links the more high quality pages you have. Both because you will have something that interests a wider audience but also because you WILL be found by more in the search engines due to all the low comp. keywords you’ll rank for. I’m sure that a linkbuilding strategy is needed but enough quality content will also do its part. Your success is a great inspiration. Thanks for sharing your experiences. Any tips about finding decent, reliable writers? I hired a few writers for a blog, about half of them accepted the position and then never wrote a single post, only 1 posted as often as I asked (5 posts a week), and the others seemed to post every now and then when they felt like it…all seemed like good candidates to start with and really wanted the role, in the end I had just 1 paid writer and I got rid of the others. Congrats, how many sites do u have that u earn that much on adsense? That’s a combination of all of my sites, I only have one site that has exceeded $1K Adsense per day. That would depends on your traffic and niche. With the Google TOS you are not allowed share such stats as CTR. You probably want to be aiming for more than 1% though. Great. need to learn a lot from people like you. Can i have a link to your site? 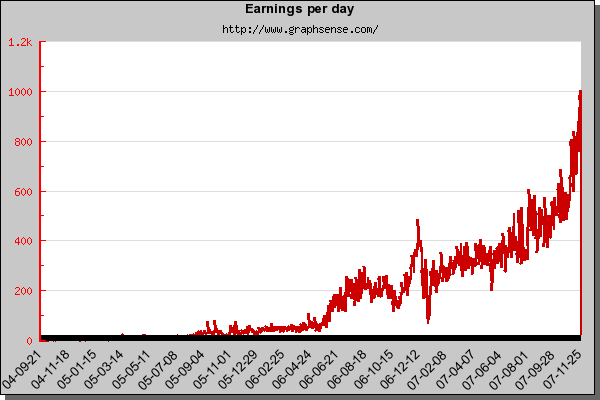 Adsense earning has gond down to 30% of the previous earnings after the clickable area update. Its amazing your earnings still on the increase. Great! I hope I can do like you one day! Thanks for the update Al… A great inspiration. Have you kept up the $1k a day since? Be interesting to see if the trend continues post-christmas. Yeah it will be interesting to see what happens. I’m expecting it to grow for the next few weeks then drop down just before Christmas. Hopefully I’ll be back at October/November levels but continuing to grow after that. Now i’m averaging $10-20 hope to reach your goal ,if not atleast $100-200/day. Great cyber monday! 🙂 How many sites worked for this goal, besides? Thanks Mindaugas, there were about 25 sites contributing but my main site http://www.Coolest-Gadgets.com is now doing the $1K day on its own and must admit make my other sites look a bit lame in comparison. Congrats for the great earning. Your thread on DP is really a great motivational post. Congrats again. Congratulations on your great Adsense day. I had ONLY one of those. That was back in 2005 when you could throw up a whole bunch of junk pages and make a nice income. Now it’s become MUCH harder to even approach that figure. So great job on doing it with good ole fashion hard work. I wish i could earn that $1,000 a day in adsense. I have been struggling to make a $10 a day for 2 years n0w. I managed to make my site fist at Yahoo engine but am still earning less than $1 a day. So frustrating, but after reading this thread, am back with my goal and i’m never giving up. Well, hope to reach that goal too like you guys! Thanks for bringing up this topic, a million thanks, very inspirational. this is huge, i make $5 a day. Wow! Im inspired by your post. I just started earning from adsense and still learning the process which lead me to your blog. This is great motivation – Thanks for the tips. Hi Al, just been reading through some of the older posts like this one, are you still gettign good results with Adsense? it would be good to get an update, we’ve not heard much on this topic in a while. Wow — a $1000 day? Are you still seeing results like this? Not from Adsense, certainly dropped off a bit this year. I need to learn how to do this! I could make $100 a day and I would FREAK THE HELL OUT! That would be amazing. I’m on a mission to learn more now. Has adsense dropped off all round with the crisis? I am looking at buying a bunch of adsense sites but worried about being able to maintain the earnings on them as I read a lot about them fluctuating. Wow, can’t believe this was 3 years ago! I was wondering if you could do an updated version. Is your cpc really low now?